While CanadaVet can't give specific veterinary advice, from time to time we will post a Q&A on our blog where we think the information is of general interest to readers. Q. Our 8 month old, spayed female kitten is very active. She jumps and dashes around the house most of the day and half the night. She is also very verbal and chew of everything. Could she have a dietary problem? A. Almost all cats complete their teething by 7 months of age, so we assume your cat has too. 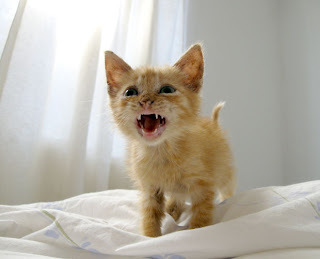 The behaviors you describe are typical of a very active, maturing kitten and are usually nothing to be concerned about. For such a kitten you should make sure you have her on a diet of canned or dreit food with a high protein content, and consider a fiber supplement or growing cat grass for her. We doubt she has a specific dieteary deficiency. The chewing is likely to be attention seeking behavior, so make sure she has plenty of attention from you each day, and lots of cat appropriate toys when she's alone. You might also want to consider taking her out for a walk on a leash. if she'll tolerate it. In extreme cases of over activity, you may wish to consider a calming remedy like Vetalogica Tranquil Formula.